Excerpted, with gratitude, from Nurses with Global Impact. Imagine sleeping in a forest with no cover from the elements and seeing your children become weaker and sicker but still knowing this was a better option. Your only option. Imagine leaving everything you had to start from scratch and live in utter fear for months. Imagine not knowing if you will make the journey alive through the Aegean Sea with your children. Imagine not eating for days in the forest or scared that you will get raped. Smugglers take roughly 2,000 Euros per person, while providing boats with holes and false life jackets. The capacity of these boats holds about 10 people. But smugglers often put 60 or more people on these boats. There was no warning of the boats coming from the Turkish side on the rocky shores of the Greek Island of Lesvos — where unless spotted by volunteers who put themselves at risk, there would be no one to receive them. There would be no one to help resuscitate drowning woman, children and people. There would be no one feeding them, directing them to safety. And then – the smile on their faces when they would come off the boats was priceless. They shouted, “She is one of us” in Farsi — and I felt such joy that I was there to help and guide them to safety. When they learned I was Afghan, and had come from America to help them, they were so relieved and so moved. I cry thinking that my presence is essentially what made them feel safe and comforted. I had women throwing their babies at me from the boat to make sure they made it to safety. Men — pulling and fighting against the ocean — grabbed my hand for safety. ME, just a nurse. ​Throughout all this hardship, I saw humanity in its absolute best. Camp Moria is a true “juxtaposition.” This camp has a striking and pervasive air of optimism which is found within the refugees, many whom have endured such awful fates in their own countries. 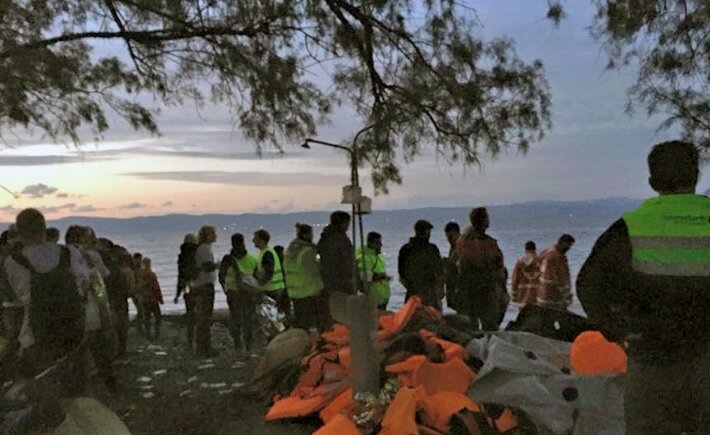 Freshta's camera captured co-volunteers waiting, in the dawn, for refugee boats to arrive. The boat that came in was full of Afghans who were scared, hypoglycemic, cold and hungry. Each one of these refugees had their own stories which they shared with me because I could understand them. As soon as we said hello. I began translating, assessing and treating patients. Despite all these circumstances they still managed to have the biggest smiles on their faces! I met one lady who cried to me and told me how awful Afghanistan has become. The Taliban is killing people, there is no food and no way to defend themselves. She cried in my arms and I could just feel all the pain in her eyes. I tried to hold my tears back — to be a stronger person for her. I reassured her that now God has given her a better future and to never give up. One of the great tragedies of the 21st century is now unfolding before our eyes — as the largest movement of people, since World War II, run for their lives from war, violence and persecutions throughout the world. Of the one million refugees who arrived in Europe by sea during 2015, 544,753 landed on the island of Lesvos, Greece, located just off the West Coast of Turkey. Many more wait in Turkey for a chance to cross the dangerous Aegean Sea. The settlement of refugees and migrants has led to fears in America and Europe about cultural, economic change, and the increase on terrorism. ​Simple necessities — found in abundance in every household throughout America — are luxuries to human beings that have nothing. Volunteer Medic Denise Schoen (on the left) joins Freshta with a refugee family — who were so happy to be safe —they asked to take a picture with them. To think that donations alone would dampen the blow is to fool oneself. The refugee crisis concerns every human being on planet earth. Therefore, it is our moral obligation to take responsibility and do our part. As a nurse — an Afghan American, a woman and now a volunteer humanitarian nurse — it has been an honor to do my part. I invite all nurses to do the same. Above: Freshta Poupal — 2nd from the left — joins, on her left, NIGH's lead UN DPI-NGO Representative — Dr. Holly Shaw, also of the UN DPI-NGO Executive Committee — for an official gathering of UN NGOs speaking to UN Members at the United Nations ECOSOC Chamber in New York City. 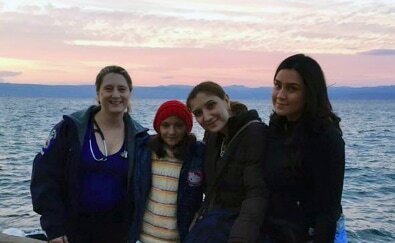 Freshta Poupal, a nurse from New York, was one of the first Afghan-American volunteers to travel to the Greek island of Lesvos in the Fall of 2015. Then, Afghan refugees didn’t wait long before leaving Lesvos. Many of the families Poupal helped are now in Germany. Poupal, 26, spent two-and-a-half weeks on the island and wrote emotional pleas on social media for other Afghans to come and translate. It didn’t take long before her calls were heard. Maqbool Siddiqi, a refugee who recently made the journey from Greece to Germany, created the Facebook Page 'Afghan Volunteer’s Coordination Team' and groups of Afghan-Americans — from California to Virginia — teamed up, fundraised on social media and headed to Greece. Men and women kept journals, shared emotional photos and videos calling for more help. “It’s truly beautiful seeing all these people respond the way they did. Now it has become a movement between Afghans from all over,” said Poupal, who recently spoke to United Nations members in New York — advocating for all refugees. Image Credits: All of the photos used on this webpage are from Freshta Poupal's archives. ​The SDG logos — featured on the upper left — are used with attribution to the United Nations.